The Department of Transportation says the school-zone devices won't just be mothballed. 7/25/18: And they're off! Twenty mobile speed camera units like this one were taken off the roads today because of inaction by the State Senate. Another 20 will be taken out of service by the end of August as the full speed camera program goes dark. Photos by Gersh Kuntzman. Smile, scofflaw, you’re still on candid camera! As 140 school-zone cameras were turned off by the state legislature, Department of Transportation Commissioner Polly Trottenberg said 100 of cameras would still collect data on speeders to be used as evidence — someday — that the program is a vital safety tool. More than 4,679,000 summonses were issued by the cameras since 2014, but the Republican-controlled State Senate, fueled by donations by anti-camera NYPD officers, failed to reauthorize the program before going out of session earlier this month. As a result, the cameras — which protected 140 school zones with fixed cameras and 40 mobile devices — can no longer hit drivers with a summons. “It’s a sad moment,” Trottenberg said on Wednesday, flanked by speed camera division employees, who will now be redeployed. 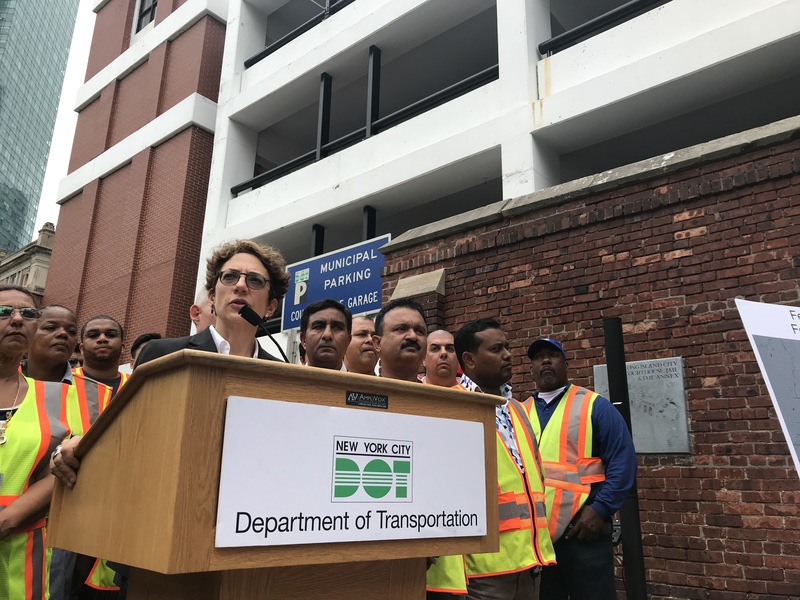 Department of Transportation Commissioner Polly Trottenberg, flanked by workers, called the end of speed cameras “a sad moment” and begged the State Senate to reconvene and pass an Assembly bill reauthorizing the city’s speed camera program. But there is some good news, she added. It is unclear if the State Senate will be persuaded. Its leader, Majority Leader John Flanagan, issued a statement on Tuesday blaming the Assembly and Governor Cuomo for his chamber’s decision not to reauthorize the cameras. Cuomo fired back on Wednesday with a blistering critique of GOP politics. 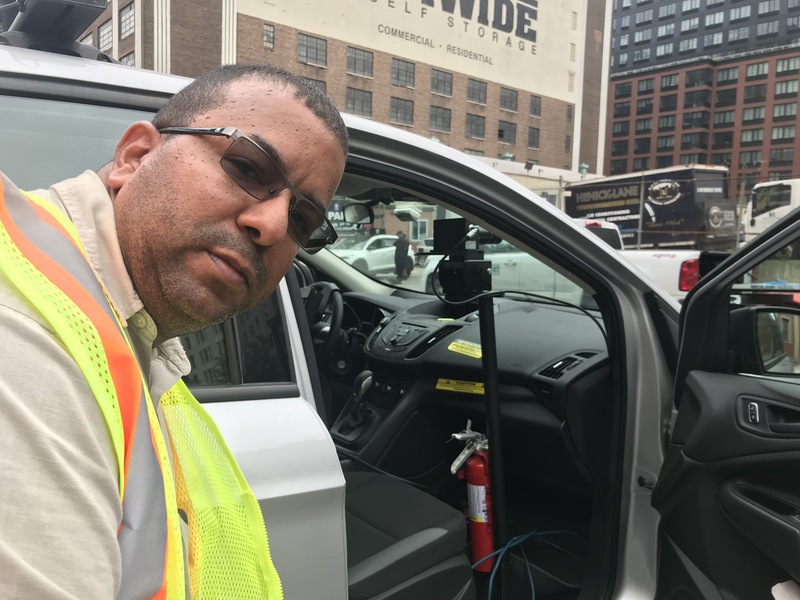 One of those workers, supervisor Ruddy Bernal, told Streetsblog that he happily caught speeders with his mobile unit, which consists of a camera mounted inside a sedan, plus a strobe light that flashes when the radar detects speeding. Ruddy Bernal says he never felt bad whenever his mobile camera unit caught a speeder. Bernal recalled sitting in the unit as the camera snapped drivers sometimes going more than 50 miles above the 25-mile-per-hour speed limit. They should print mock tickets and mail them all to Flanagan. Hopefully the data will be available so you can look up plate numbers. It’s confusing linking into these articles without knowing which city they’re written about. The headline nor the first few paragraphs and caption gave no clue. I got to the article from http://www.streetsblog.org. If ever linked from other websites, it is equally confusing. Just a friendly tip on how to make these articles more readable to the general public. I like the idea of continuing to send letters even if they can’t get a ticket. 1) Let’s the car owner know the person they let use it was driving dangerously. Good for parents and anyone else who lets family drive, which is most people I’ve known. 2) Have rotating messages that go out. Other messages that basically poke everyone who opposes them. Police brass are saying the right things, but they simply don't have the resources to issue tickets like cameras do. Addressing Transportation Alternatives' Vision Zero Cities conference this morning, Mayor de Blasio restated his intent to expand the city's speed enforcement camera program this year, which requires approval from Albany.